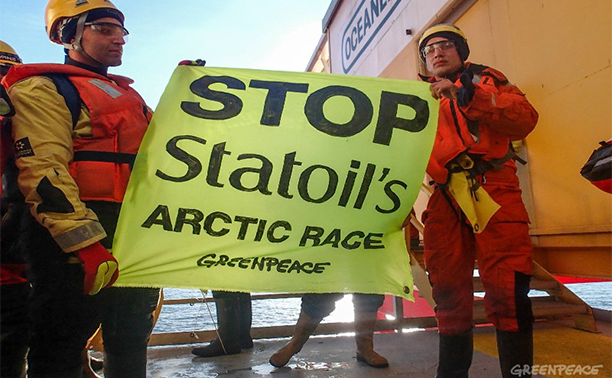 Police today removed seven Greenpeace protesters from a Statoil ASA oil rig in the Norwegian Arctic Ocean. Afterward, a Greenpeace ship reached the site of Statoil’s planned oil well with the company’s rig just hours away. “The Greenpeace ship Esperanza is blocking the arrival of Statoil’s Transocean Spitsbergen oil rig in the Arctic by occupying the exact location where the company plans to drill the world’s northernmost well,” the group said a statement. Norwegian authorities earlier removed the seven activists from the oil rig bound for a remote part of the Barents Sea where Greenpeace claims oil drilling would harm the region’s marine wildlife. Greenpeace’s Truls Gulowsen said the activists were released without being charged. The group has appealed the project to the Norwegian Ministry of Climate and Environment. Statoil can’t start drilling until the agency issues a final ruling.